Verdict: The Whirlpool whole house water filter is a reasonably priced, almost maintenance free unit. If you’re looking for something that you can install, set, and forget for long periods of time, this may be the unit for you. The WHELJ1 isn’t as expensive as some similar models. However, don’t let that worry you because the Whirlpool whole house water filter comes with a name that you’re familiar with and should be able to trust. Keep reading our Whirlpool WHELJ1 review to learn more. The Whirlpool WHELJ1 whole house water filter is different from a lot of water filters on the market because there are no filters to replace. This makes the Whirlpool central water filtration system more or less maintenance free. You will have the opportunity to install and setup your WHELJ1 and from then on you won’t have to bother with it much, if at all. You might be wondering how the Whirlpool central water filtration system can work without filters. The answer has to do with the FilterSense technology that is unique to the Whirlpool WHELJ1. Instead of having to replace your filters, the Whirlpool whole house filter complete filtration system has an automatic system that will flush, drain, and ultimately clean your filter every two weeks. Is your water really bad? If it is, you can program the Whirlpool WHELJ1 to clean itself more than the standard two weeks. One of the only downsides, as we’ll discuss more in this Whirlpool WHELJ1 review, is that because of how the system cleans itself, water waste is also created as a side effect. The filter media won’t be able to be replaced. This means that when the unit has run its course, you’ll need to get an entire new system. That said, the Whirlpool WHELJ1 lasts for ten years or one million gallons, so as stated earlier in this Whirlpool WHELJ1 review, you’re going to get a fair deal for your money. 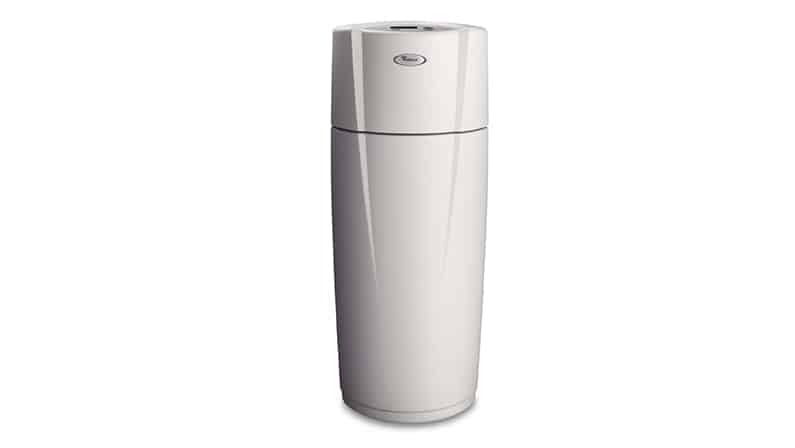 Like other whole house water filters, the Whirlpool WHELJ1 works by removing chlorine and sediment from your water. According to testing, it is able to remove particles down to 40 microns. This is not as good as some competitors but isn’t bad either. If you’re worried about the taste of your water or you don’t like the smell when you turn on the faucet, the Whirlpool will help to improve both issues. It will also reduce or remove issues with sediment and lower the chlorine levels in your water. On the other hand, if your water has higher iron levels or is contaminated by higher levels of other metals, you might want to consider pre-treatment. Unlike some water filtration systems, the Whirlpool WHELJ1 does not have a pre-filter. The pre-filter protects the main filter. What that means is that if you’re dealing with issues like lead, it’s possible that the particles from the contaminated water could clog the filter. For this reason, if your main concern is lead a different whole house water filter might be better suited for your needs. Nearly everything you need to install the Whirlpool WHELJ1 will be included when you receive the unit. You will need some standard tools that you probably already have around your home. You’ll also need two 1” NPT female connectors and enough tubing so that you can connect your unit to your existing pipes. When you’re setting it up you’ll need to consider the location, as the Whirlpool WHELJ1 is going to require access to both an electrical outlet and a drain. The unit either needs to be within 10 feet of the drain or you will need extra tubing, as that’s the length you’re given with the unit. The instruction manual is helpful, but is not as detailed as it could be. If you’ve never setup a system like this, you might be a little confused at times. There are videos on the Internet that can help guide you along and get the job done. If you’re stuck and don’t want to continue, you can call customer service to get the help you need. You could also have a plumber install your system, if necessary. That said, the majority of people should get through installation without having to do that. In the end, the Whirlpool WHELJ1 is a reasonably priced water filter that’ll improve the water in your home. If your main issue is the smell or taste of your water, this is the water filtration system for you. It is also perfect if you have issues with sediment or too much chlorine in the water. That said, if you have problems with lead you might want to seek out a different system. As good as the Whirlpool WHELJ1 is, it is a water softener above all else.